About how much will my premiums be if I’m a 32-year-old, healthy, non-smoker? Unless you have an overabundance of time and patience, you’ll need a website like Quotacy that offers a free tool that allows you to compare life insurance quotes and make an informed choice. The right tool can make your life insurance policy research quick, productive, and frustration-free. Keep the following tips in mind as you look for the best comparison tool for life insurance quotes. Term life insurance isn’t a one-size-fits-all product, and your web research should reflect that. 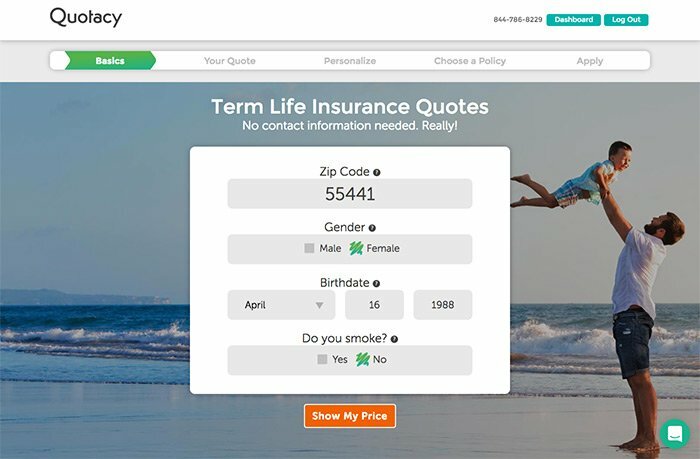 If a website with term insurance quotes only shows a single price—rather than a range of possible premium rates—you’re probably not getting the whole story. Don’t waste time on a website that won’t allow you to easily compare life insurance quotes from potential insurers. Know if your life insurance broker offers policies that match your budget and objectives before you buy your policy online. At Quotacy, we show you upfront what your price will be, so you can increase (or decrease) your coverage to match your budget expectations. 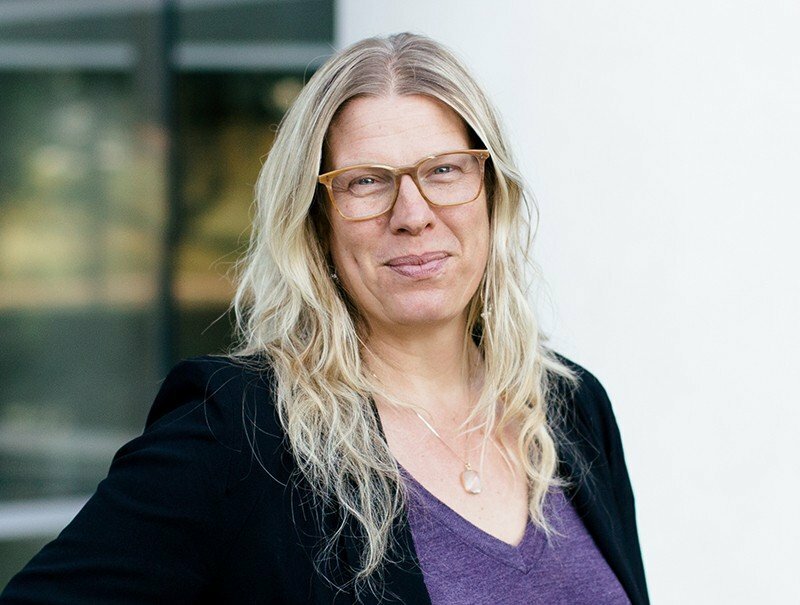 A website offering only a name, an 800-number, or an email as their company information may not be the most reliable source when it comes to finding you the answers that you need. Don’t trust recommendations that omit critical information about insurers such as Better Business Bureau ratings. These are invaluable pieces of information that you’ll need to be certain that you’ll be dealing with a top-rated insurance brand. A website that requires you to enter extensive personal information before accessing general information on policy offers is emphasizing sales over service, and you’ll probably find more reliable information elsewhere. A website that doesn’t provide a basic summary of available policies (unless you opt-in for a sales call) is the equivalent of a used car salesperson offering a special deal if you step inside their office. At Quotacy, we let you find your quote first without talking to an insurance advisor (unless you want to, of course). At Quotacy, we don’t ask you to surrender your personal details before we get you your quotes. We know you want to find out how much your life insurance policy will cost before you decide to apply. 4. Look for a website that offers a simple way to select and apply for a policy. 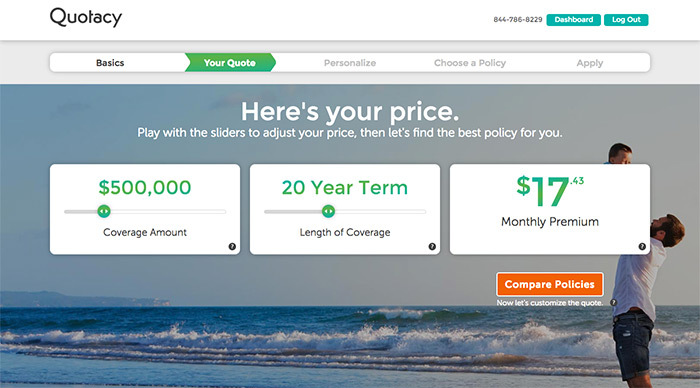 A website promising to help you compare life insurance quotes should make your search for the right policy easier—and applying for it —completely painless. It ought to be simple to see multiple term insurance quotes side-by-side, so you can choose from several trusted companies without having to navigate to a different screen. If you have to spend several minutes hunting for a how to apply button in order to submit your information, you’re on a website that’s neglected to think of user experience, and that doesn’t reflect well on their attention to customer service. You need a tool that allows you to find the information that you need to compare life insurance quotes on a single page. When you want to effectively compare life insurance quotes, using the right comparison tool isn’t just a matter of convenience. If the range of offers that you’re presented with isn’t truly representative of the best options that fit your needs, then it’s likely you’ll endure a sales call—or several calls— that may end up being a waste of time. Comparing the best life insurance policies can be a challenge because, even if you find a range of appealing quotes online, you’ll need to take into account certain factors—such as your job, medical history, lifestyle, or hobbies—that will impact your eligibility for certain rates and how much insurance you require. Using the right life insurance quotes website, however, you’ll find a select pool of the most affordable policies that meet your needs. That’s why we offer a needs assessment tool that allows you to estimate how much coverage you’ll need, along with free access to our insurance advisors who can help you make sense of it all. We’ve spent years helping families and individuals painlessly assess their insurance needs and find the best offers from America’s leading insurance companies. So, don’t be shy! Stay a while and compare life insurance quotes with our free tool!